Accommodates many office machines such as fax, printer or copiers. 3/4" furniture-grade wood with stain and scratch resistant finish. Double door cabinet provides concealed storage. Top has 4" opening for cable routing. Storage shelf has grommet cut-out for cable routing into lower cabinet. Lower Storage Compartment measures 26"w x 17 3/4"d x 14 3/4"h; Upper Compartment measures 26"w x 17 3/4"d x 9 1/8"h. Mobile on two casters (two locking). Color: Cherry; Capacity (Weight): 200 lbs. ; Caster/Glide/Wheel: Four 2" Casters (2 Locking); Material(s): Furniture Grade Particleboard. 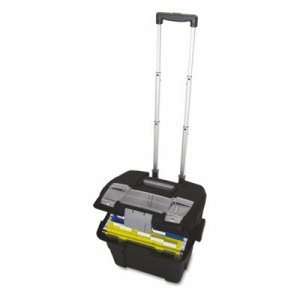 Durable plastic and steel cart transports letter size files. Snap lid includes built-in organizer compartment for convenient access to supplies. Telescoping push button handle and rubberized wheels for easy mobility. Color: Black; Capacity (Weight): 45 lbs. ; Caster/Glide/Wheel: Two 3 1/2" Wheels; Material(s): Metal; Plastic. Perfect for use in libraries, schools or any work area with a large collection of books. All-steel construction with unique hole pattern design is accented by tubular steel legs. Oversized casters for easy maneuverability. Black powder coat finish for durability. Three 8" deep slanted shelves on each side of cart. 12" clearance between shelves. Includes a height-adjustable file pocket. 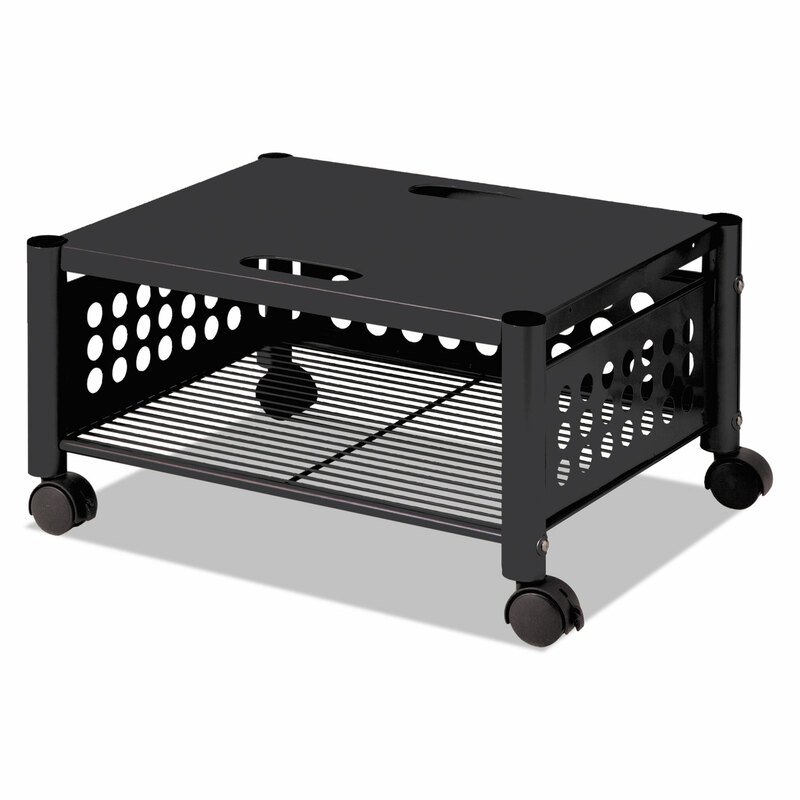 Color: Black; Caster/Glide/Wheel: Four Oversized Casters; Material(s): Steel; Overall Width: 41 1/4". 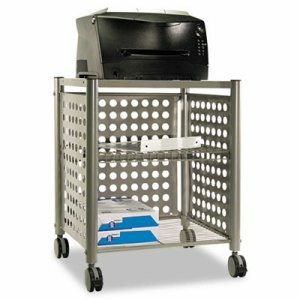 Lightweight cart folds open to create a roomy option for storing and transporting files. Folds flat to the size of a briefcase for convenient storage when not in use. Lower shelf accommodates additional supplies. Smooth-rolling casters for easy mobility. Color: Black; Clear; Overall Width: 14 1/2"; Overall Depth: 18 1/2"; Overall Height: 21 3/4". Sturdy steel wire construction with scratch-resistant powder coat finish for durability. Hanging file frame holds letter or legal-size folders. Handy bottom shelf for supplies. Rolls easily on four casters (two locking). Tucks under most worksurfaces when not in use to free up valuable floor space. Color: Black; Capacity (Weight): 300 lbs. ; Caster/Glide/Wheel: Four 2" Casters (2 Locking); Material(s): Steel. 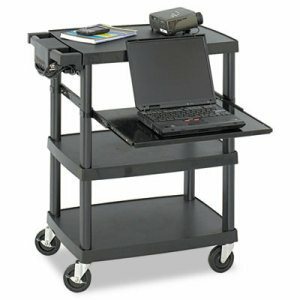 Easy access suspension file cart fits under most worksurfaces. Sturdy all-steel frame with built-in hanging rails holds letter size hanging folders (not included). 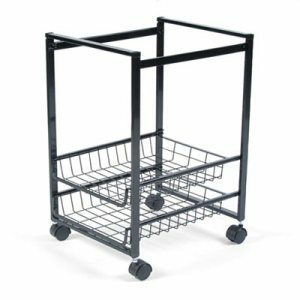 Two pullout wire-grid baskets store supplies and keep things at your fingertips. Color: Black; Caster/Glide/Wheel: Four Swivel Casters (2 Locking); Material(s): Steel; Wire; Overall Width: 12 7/8". 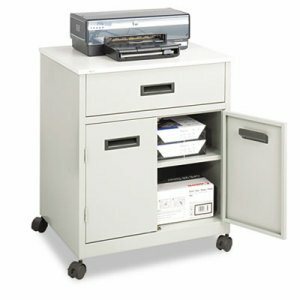 Easy access suspension file cart fits under most worksurfaces. Sturdy all-steel frame with built-in hanging rails to hold letter or legal size files. 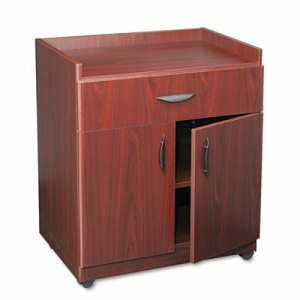 Extra large 9 1/2w x 14 1/2d x 3 3/4h drawers store large-size documents and material. 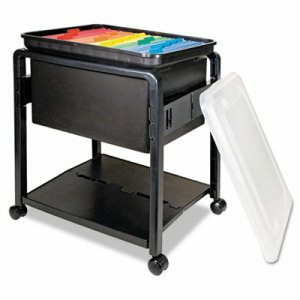 Color: Black; Caster/Glide/Wheel: Six Easy-Roll Casters (2 locking); Material(s): Steel; Overall Width: 38". Ideal for printers, fax machines and personal copiers. Durable steel and wire construction. Handy bottom shelf keeps supplies close at hand. Two surface grommets help route cords and cables; can also be used as a handle to pull stand from beneath worksurface. Four twin-wheel casters, two locking, for easy mobility. Color: Black; Capacity (Weight): 90 lbs; Caster/Glide/Wheel: Four Twin-Wheel Casters (2 Locking); Material(s): Steel; Wire. Machine stand to meet user needs in private office, collaboration space, print area or meeting room. Silver powder coat steel frame for durability with translucent polycarbonate side and back panels. 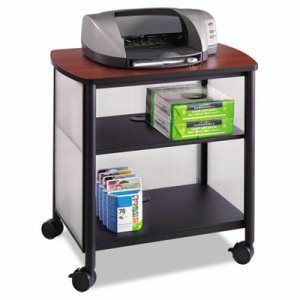 Cherry or Gray laminate top accommodates most office machines. Large storage area with one fixed shelf behind two translucent hinged doors. Convenient cord management. Four casters (two locking) for easy mobility. 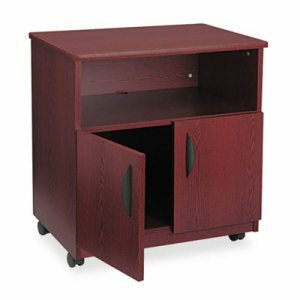 Color: Black/Cherry; Caster/Glide/Wheel: Four 2 1/2" Casters (2 Locking); Material(s): Laminated; Polycarbonate; Steel; Overall Width: 34 3/4". 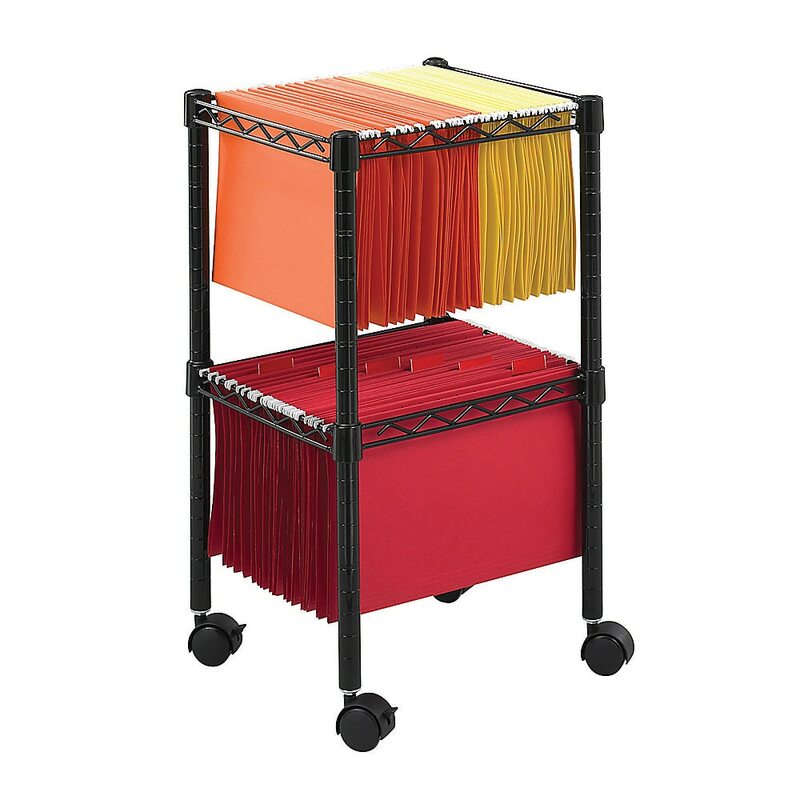 Open top file cart assembles in seconds with no tools required! Provides quick access to letter-size hanging file folders. 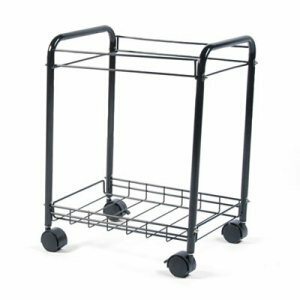 Durable steel and wire construction with convenient bottom storage shelf. Easily mobile on four swivel casters, two locking. Color: Black; Caster/Glide/Wheel: Four Swivel Casters (2 Locking); Material(s): Steel; Wire; Overall Width: 15". Ideal for printers, fax machines and personal copiers. Durable steel and wire construction. Two shelves, one adjustable, help keep supplies close at hand. Four twin-wheel casters, two locking, for easy mobility. 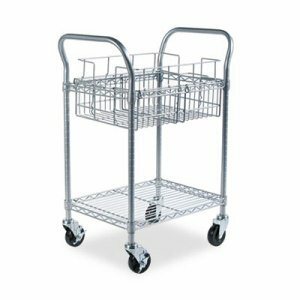 Color: Matte Gray; Caster/Glide/Wheel: Four 3" Twin-Wheel Casters (2 Locking); Material(s): Steel; Wire; Overall Width: 21 1/2". Ideal height for multimedia projectors and holds monitors up to 20". Heavy gauge plastic construction resists dents and scratches. Height-adjustable, steel pullout shelf is perfect for laptops. UL approved, three-outlet mini surge protector with power switch included with a 10 ft. power cord and cord management bracket. Three 24 1/2" x 18 1/2" shelves. Four casters (two locking). Color: Black; Capacity (Weight): 80 lbs. ; Caster/Glide/Wheel: Four Casters (2 Rear Locking); Material(s): Plastic. 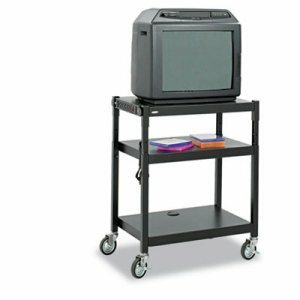 Powder coated steel cart (for durability) holds up to a 20" monitor. Three 24 x 18" shelves, plus six-outlet UL approved mini-surge protector with power switch. Adjustable in 2" increments from 28 1/2" to 36 1/2" high. Ideal for media equipment. 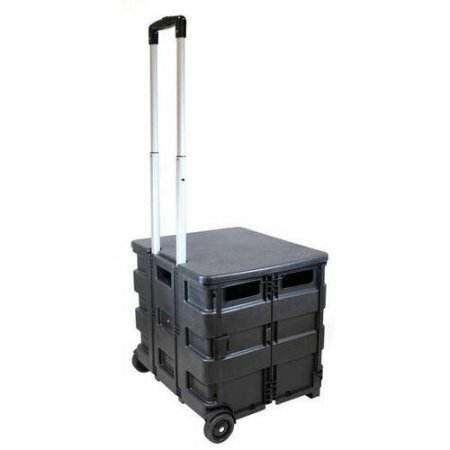 Mobile on four 4" casters (two locking). Color: Black; Capacity (Weight): 120 lbs. ; Caster/Glide/Wheel: Four 4" Casters (2 Locking); Material(s): Steel. 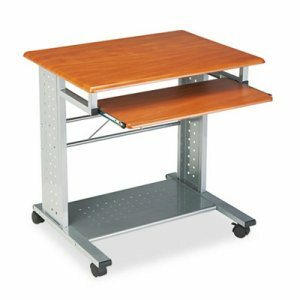 Steel stand with powder coat finish for durability and scratch resistant laminate too. Large top supports most office machines. Double-door enclosed cabinet for supply storage with fixed interior shelf. Convenient pullout drawer stores smaller office supplies. Mobile on four casters (two locking). 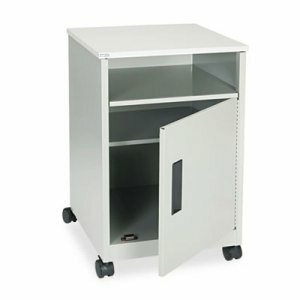 Color: Gray; Caster/Glide/Wheel: Four Casters (2 Locking); Material(s): Laminated; Steel; Overall Width: 25". 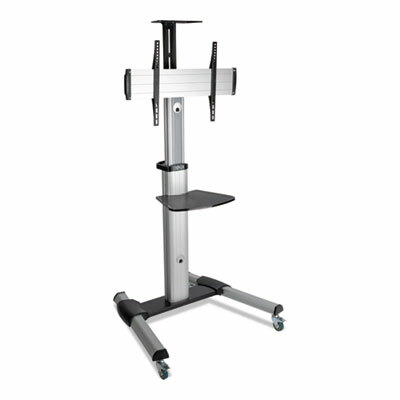 Versatile, mobile machine stand holds printer, fax machine or other office equipment. Tubular steel frame with a 20"w x 18"d laminate top that expands to a 36"w x 18"d work surface by raising two 8" drop leaves. Modesty panel provides privacy. Mobile on four casters (two locking). 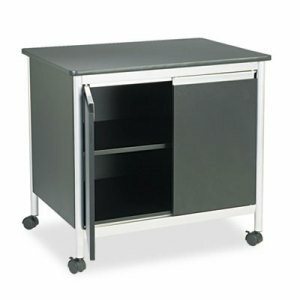 Color: Black; Caster/Glide/Wheel: Four Casters (2 Locking); Material(s): Laminated; Steel; Overall Width: 20" - 36". 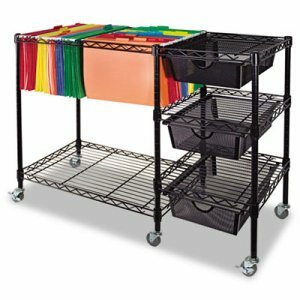 The steel frame and a powder coat finish, for durability, makes this machine stand a durable organization solution. Featuring two sturdy shelves to hold paper, supplies or snacks, which makes it perfect for common work areas or meeting spaces. Mobile on four casters, (2 locking). Stand holds up to 200 lbs. Color: Black; Capacity (Weight): 200 lbs. ; Caster/Glide/Wheel: Four Casters (2 Locking); Material(s): Steel. Ample filing space with a compact footprint meets mobile, high-density filing needs. Sturdy steel wire construction with scratch resistant black powder coat finish for durability. Hanging file frames accommodate letter and legal-size folders (not included). Tucks under most worksurfaces when not in use. Mobile on four casters (two locking). Color: Black; Capacity (Weight): 100 lbs. ; Caster/Glide/Wheel: Four 2" Casters (2 Locking); Material(s): Steel Wire. Heavy-duty steel, welded wire construction. Top basket holds legal-size hanging folders. Convenient dual handles. Bottom shelf for bulk mail and parcels. Mobile on four casters (two locking). Color: Metallic Gray; Capacity (Weight): 600 lbs. ; Caster/Glide/Wheel: Four 4" Casters (2 Locking); Material(s): Steel Wire. 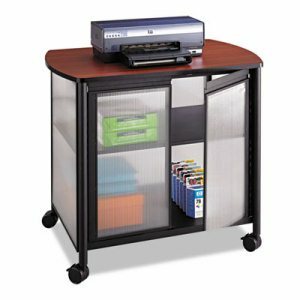 Designed for oversized office equipment, this machine stand features a double door cabinet with one fixed shelf for supplies. 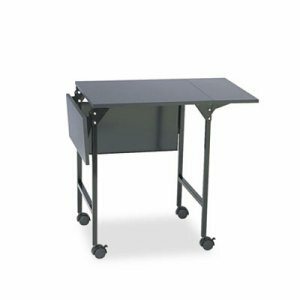 Scratch resistant Black laminate top with steel metallic gray legs, with a powder coat finish for durability. Mobile on four casters (two locking). 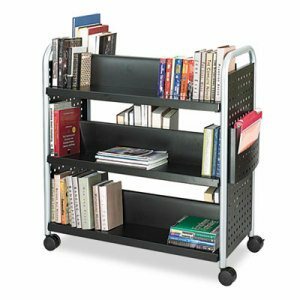 Color: Black; Caster/Glide/Wheel: Four Casters (2 Locking); Material(s): Steel; Overall Width: 32". Heavy-duty steel construction for high volume delivery needs. 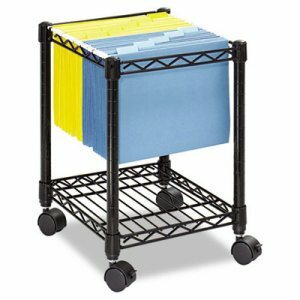 Top basket holds legal size hanging file folders. Bottom shelf holds bulk mail or packages. Rugged steel construction. 200 lb. capacity. Color: Dove Gray; Capacity (Weight): 200 lbs. ; Caster/Glide/Wheel: Four 4" Front Swivel Casters, 10" Semi-Pneumatic Rear Wheels; Material(s): Steel. 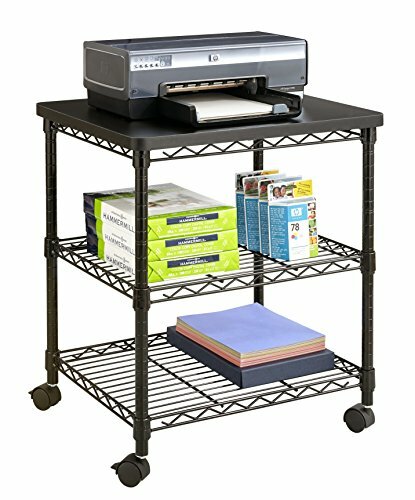 Use Machine Stand to free up additonal desk space and keep supplies close and organized. Powder coat steel frame for durability with translucent polycarbonate side and back panels. Accommodates most office machines. Large storage area with one fixed shelf. Four casters (two locking) for easy mobility. Convenient cord management. Color: Black/Cherry; Capacity (Weight): 100 lbs. ; Caster/Glide/Wheel: Four 2 1/2" Casters (2 Locking); Material(s): Laminated; Polycarbonate; Steel. 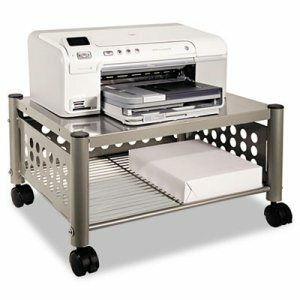 Accommodates many office machines such as fax, printer or copiers. 3/4" furniture-grade wood with stain and scratch resistant finish. Double door cabinet provides concealed storage. Top has 4" opening for cable routing. Storage shelf has grommet cut-out for cable routing into lower cabinet. Lower Storage Compartment measures 26"w x 17 3/4"d x 14 3/4"h; Upper Compartment measures 26"w x 17 3/4"d x 9 1/8"h. Mobile on two casters (two locking). Color: Mahogany; Capacity (Weight): 200 lbs. ; Caster/Glide/Wheel: Four 2" Casters (2 Locking); Material(s): Furniture Grade Particleboard. Ideal for printers, fax machines and personal copiers. Durable steel and wire construction. Handy bottom shelf keeps supplies close at hand. Two surface grommets help route cords and cables; can also be used as a handle to pull stand from beneath worksurface. Four twin-wheel casters, two locking, for easy mobility. 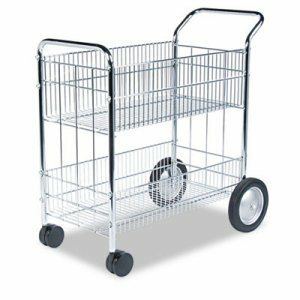 Color: Matte Gray; Capacity (Weight): 90 lbs; Caster/Glide/Wheel: Four Twin-Wheel Casters (2 Locking); Material(s): Steel; Wire. 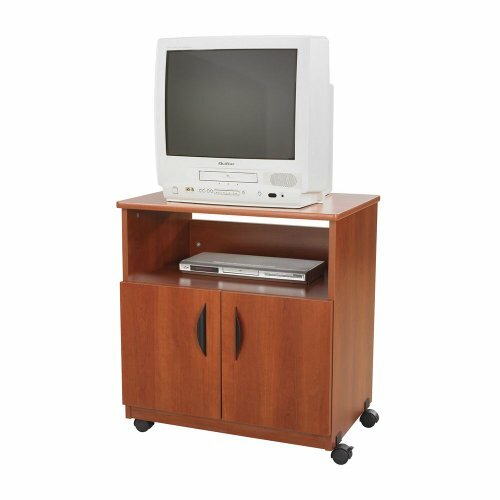 Mobile flat panel floor stand for 32" to 70" flat panel monitors. Landscape or portrait mounting. Locking 4" swivel casters. Supports up to 110 lbs. Wall/Ceiling Mounts & Hardware Type: Flat Panel Floor Stand; Mounting: Floor; Depth: 27 3/5"; Width: 32 3/5". 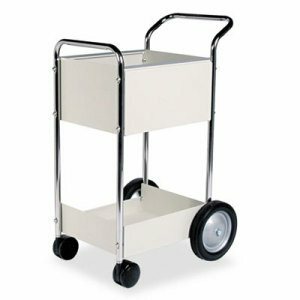 Use as a machine stand or beverage cart with fully enclosed storage compartments. Double door cabinet provides concealed storage with adjustable shelf. Top has 2" high lip on three sides to secure machines or contain spills. Pullout drawer to store supplies. Lower Storage Compartment: 28 1/2"w x 18 3/4"d; Pullout Drawer: 27 1/"2w x 17 3/4"d x 5"h. Mobile on four casters (two locking.) Color: Mahogany; Capacity (Weight): 200 lbs. ; Caster/Glide/Wheel: Four 2" Casters (2 Locking); Material(s): Furniture Grade Particleboard. Sleek design fits neatly into smaller areas. 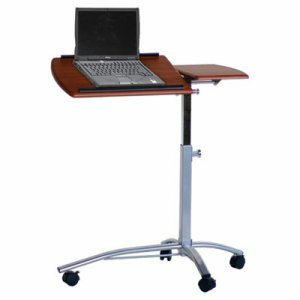 Steel stand has a durable powder coat finish and a scratch resistant laminate top. Single-door enclosed cabinet for supply storage and fixed interior shelf. Open area under top for frequently accessed materials. Storage pocket inside door for manuals. Mobile on four casters (two locking). 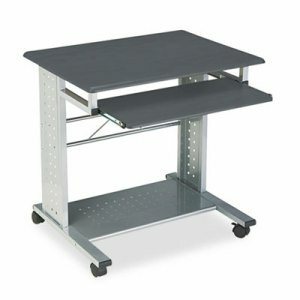 Color: Gray; Caster/Glide/Wheel: Four Casters (2 Locking); Material(s): Laminated; Steel; Overall Width: 17 1/4". Durable, 3/4" tubular frame with wire file supports, for stability, accommodates letter or legal-size folders. Lipped, wire grid bottom shelf securely holds supplies. Scratch-resistant powder coat finish for durability. 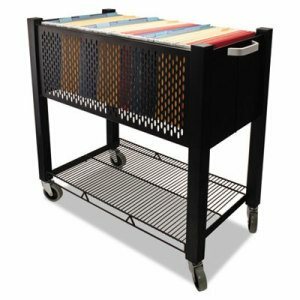 Cart fits under most worksurfaces for easy storage. Mobile on four casters (two locking). Color: Black; Caster/Glide/Wheel: Two Dual-Wheel Casters (two locking). ; Material(s): Tubular Steel; Wire; Overall Width: 17 1/2".